Stock # K4108485, L Electric Motor, Automatic, 2950 mi. 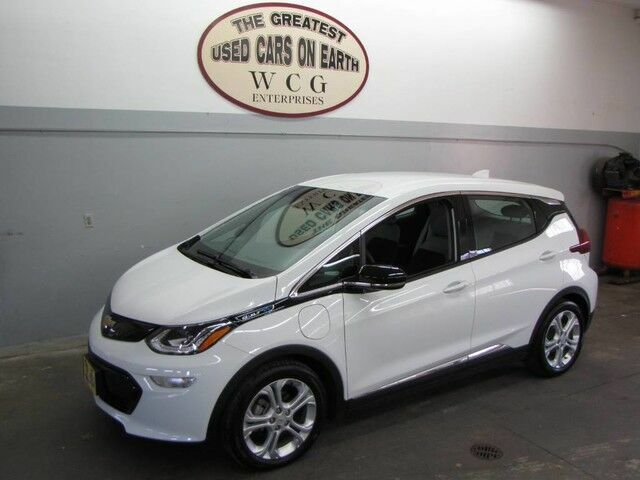 Contact WCG Enterprises today for information on dozens of vehicles like this 2019 Chevrolet Bolt EV LT. This Chevrolet includes: WHEELS, 17" Aluminum Wheels LPO, CHARGE CORD, PORTABLE, 120-VOLT, ADDITIONAL COMFORT AND CONVENIENCE PACKAGE Heated Steering Wheel Auto-Dimming Rearview Mirror Leather Steering Wheel Heated Front Seat(s) AUDIO SYSTEM, CHEVROLET INFOTAINMENT SYSTEM Smart Device Integration AM/FM Stereo Bluetooth Connection Auxiliary Audio Input MP3 Player DRIVER CONFIDENCE II PACKAGE Lane Departure Warning Lane Keeping Assist ENGINE, NONE (STD) Electric Fuel System Electric Motor AIRBAGS, DRIVER AND FRONT PASSENGER DUAL-STAGE FRONTAL Passenger Air Bag Sensor Front Side Air Bag Front Head Air Bag Passenger Air Bag Knee Air Bag Driver Air Bag SEATS, FRONT BUCKET (STD) Bucket Seats DRIVER CONFIDENCE PACKAGE Rear Parking Aid Blind Spot Monitor Cross-Traffic Alert DARK GALVANIZED/SKY COOL GRAY, DELUXE CLOTH SEAT TRIM Cloth Seats SUMMIT WHITE *Note - For third party subscriptions or services, please contact the dealer for more information. * This vehicle is loaded with great features, plus it comes with the CARFAX BuyBack Guarantee. Enjoy an extra level of calm when purchasing this Chevrolet Bolt EV LT, it's a CARFAX One-Owner. The CARFAX report shows everything you need to know to confidently make your pre-owned purchase. The interior of this Chevrolet Bolt EV LT has been through meticulous inspection and could almost pass for a brand new vehicle. When all factors are equal, choose a vehicle equipped with a factory warranty like this gently driven gem.